"If you're riding along in your car (slowly, please) and you see a car, or more probably a pickup truck, stopped in the lane in front of you and the driver is leisurely conversing with the occupant of a vehicle, most probably another pickup truck, headed toward you in the other lane, please do not honk your horn. Do not lose your patience, or you'll be sent home. Take a deep breath, reach over in the back seat to the cooler of beer you keep there and pop one until traffic clears." Not much has changed in the last 20 years...except that it's no longer a good idea to "pop one until traffic clears." Our local deputies (and the occasional state trooper on the island) frown on drinking and driving. In 1663 & 1665, King Charles II, newly restored to the English throne, appointed eight Lords Proprietors to govern the territory of Carolina (at that time, all of the land between 31° and 36° north latitude, and extending from the Atlantic to the Pacific). In 1719 John Lovick acquired "Occacok" Island as a grant from the Proprietors. 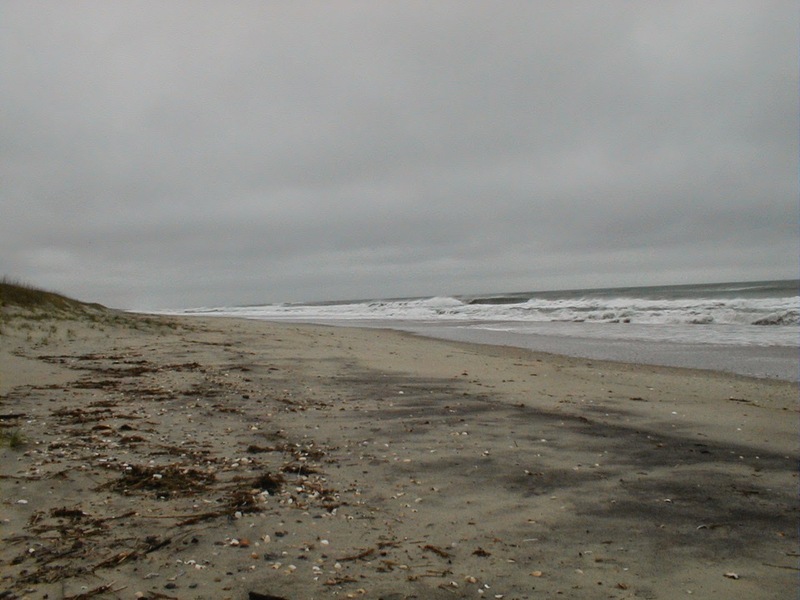 Sometime before 1733 Ocracoke came into the possession of Richard Sanderson, an English sea captain. At Sanderson's death in 1733 the island passed to his son, Richard Sanderson, Jr., who sold it to William Howard, Sr. for £105, in 1759. Dale Sanderson is a direct descendant of Richard Sanderson, who sold Ocracoke to William Howard. Dale and his brother only recently discovered their connection to Ocracoke. They live in Colorado, where their family had migrated, after passing through Tennessee, Alabama, Mississippi, Arkansas, and Texas. Dale was on a journey tracing his family roots. We had a delightful time sharing family history, and touring Ocracoke. Capt. Rob Temple stopped by to interview Dale, who goes by the nickname, Sandy. You can read Rob's delightful article in the Ocracoke Current: http://www.ocracokecurrent.com/107262. I thought our readers (especially those not on Facebook) would enjoy a few photos from yesterday. I recently came across this vintage photo. It shows a typical mode of Ocracoke Island transportation before the advent of automobiles and paved roads. Most people walked where they needed to go. Some went by horseback. But the two-wheeled pony cart proved to be a convenient way to travel, especially if there was a load to haul, a distance to go, or passengers to carry. I am not sure who the people in this photo are, but this image, the best picture of an island pony cart that I am aware of, is part of the Ocracoke Preservation Society, Mary Ruth Dixon Collection. Many thanks to OPS and Mary Ruth for permission to share the picture. Here is another photo that Chester Lynn shared with me from years ago -- a scene from one of the July 4th Parades. 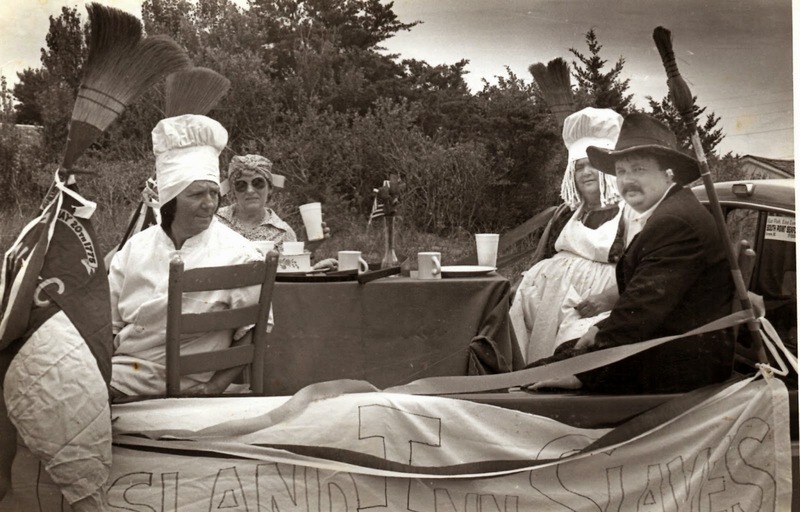 Pictured above, on their float, "Island Inn Slaves," are Grace Gaskill, Lydia Frieda Spencer, Betsy Anna Midgette, and Chester Lynn (the Island Inn restaurant manager). Chester now owns and operates Annabelle's Florist & Antique Shop on the Back Road. Stop by and pay him a visit (tell him you saw his photo on the Ocracoke Journal). We have published another Ocracoke Newsletter. This month's article is about the Wahab family of Ocracoke, and research about their origins...Arab or Scotch-Irish? You can read the current Newsletter here: http://www.villagecraftsmen.com/news022115.htm. Many of our readers know the story of the 1942 sinking of the British armed trawler HMT Bedfordshire, and the British Cemetery on Ocracoke. But few know the story of the ship's stoker, Sam Nutt, who by a curious turn of events, was the only member of the Bedfordshire's crew to survive. "'The Bedfordshire was one of twenty four that was sent over to the States. We sailed down to Norfolk Virginia then down to Morehead City, which was our base, and we worked from there convoying, escorting and then patrolling'. "On May 10th 1942, Sam had been on shore leave and was due to join the Bedfordshire the next morning. That night while leaving a bar in Morehead City, he was arrested by two policemen and locked up in a cell without an explanation. "The next day on May the 11th, HMS Bedfordshire, with their stoker still missing, went out as usual and patrolled the coast. During that night her luck suddenly run out and she was torpedoed and sunk by a U-boat. All 37 crew were lost and only four bodies were ever recovered from the sea. "Meanwhile after being released with no charge, Sam had been trying to join his ship. "A few days later it was concluded that the trawler must have been sunk by a U-boat. Evidence of this was later confirmed in the diary of U558." This month's Ocracoke Newsletter is about the almost forgotten 1890 "Oyster Wars" that pitted islanders against outside business interests. You can read the article here: http://www.villagecraftsmen.com/news012115.htm. 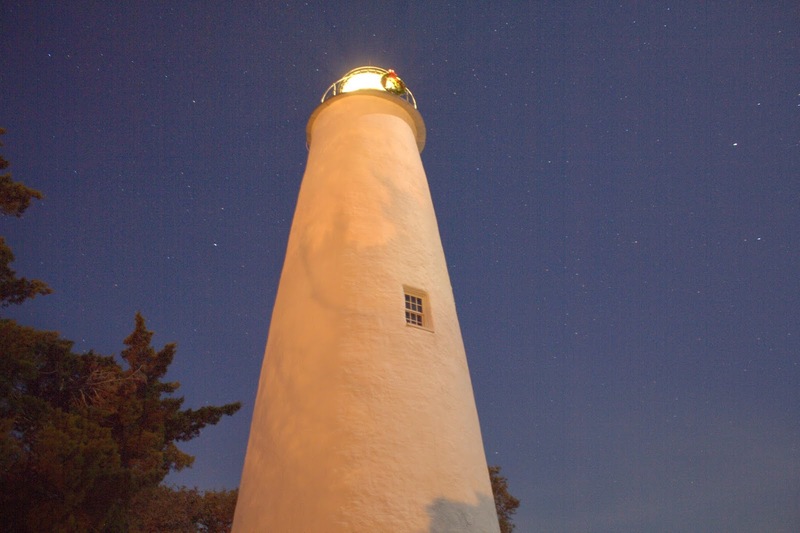 The Ocracoke Lighthouse was built in 1823 for $11,359.35 (that included the keeper's quarters). The original rotating light was produced by a reflecting, illuminating apparatus fueled by whale oil. 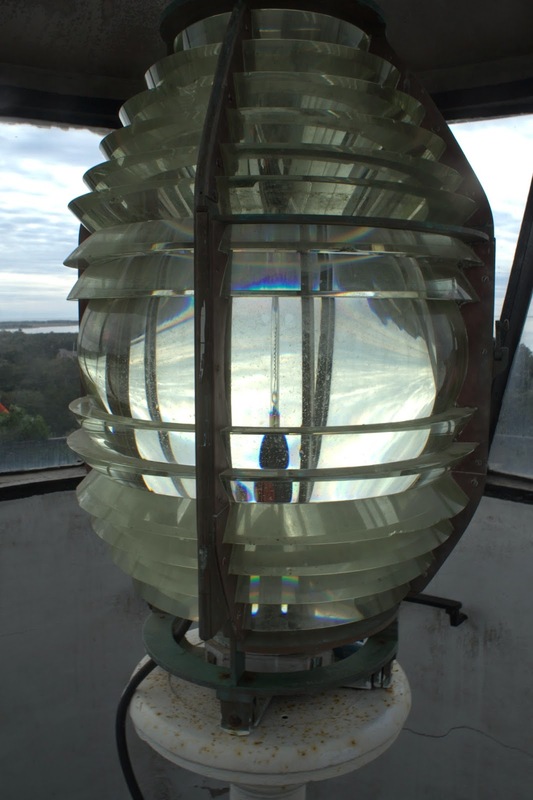 In 1854, Ocracoke's revolving light and old reflecting system was replaced by a fixed white light surrounded by a fourth order Fresnel lens. A Franklin lamp replaced the old valve lamp in 1899 (see http://uslhs.org/sites/default/files/assets/resources/Lighthouse%20Related%20Patent%20Models.pdf for descriptions and photos of various lighthouse lamps, regulators, and burners). A new Fresnel lens was installed soon thereafter. 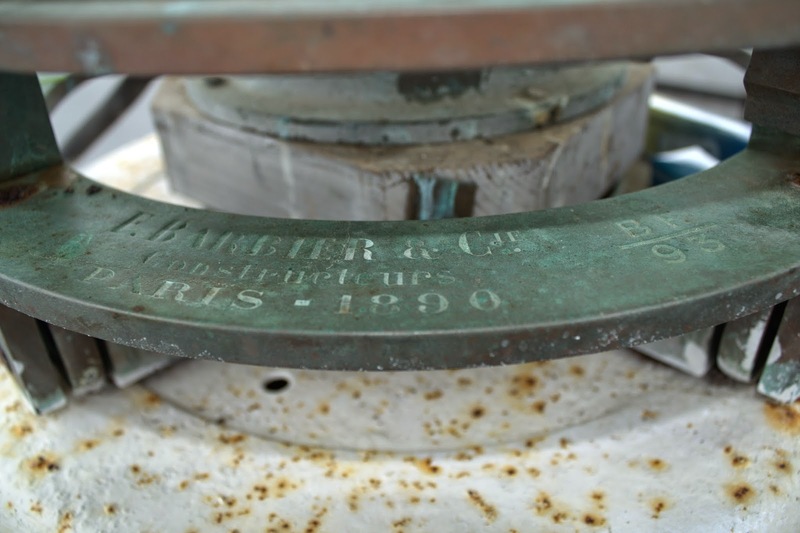 The bronze base of the Fresnel lens, which is still in use today, is embossed with this information about the manufacturer: F. BARBIER & Cie. Constructeurs PARIS - 1890. In August, 2012, I wrote about the 1861 "Hotel DeAfrique" on Roanoke Island. In honor of National African American Heritage Month (February), I am republishing that post, with some minor changes. Immediately afterwards a number of slaves made their way to Hatteras for protection. They quickly erected housing which was dubbed "Hotel DeAfrique." In 1863 a much larger "Freedman's Colony" was established by military order on Roanoke Island. At one time the population of the colony reached 3,000 residents, and included a sawmill, a fishery, and schools. A number of descendants of the original colony live on Roanoke Island today. "[This photo] depicts the Hotel d'Afrique, a building erected near Fort Hatteras for the reception of contrabands [during the American Civil War "contraband" referred to a black slave who escaped to or was brought within the Union lines.]. There are upward of forty there now." Our current Ocracoke Newsletter is the story of the 1890 Ocracoke Oyster War (click on the link below to read the article). As a result of the conflict, North Carolina established laws to promote and protect the oyster interests of the state. 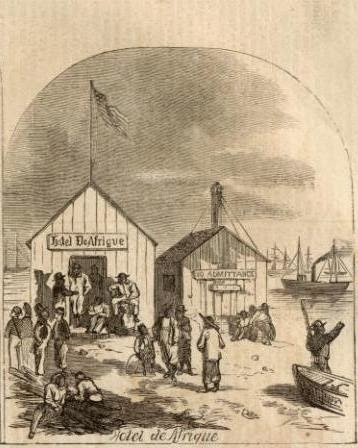 A number of islanders then purchased licenses to harvest oysters. 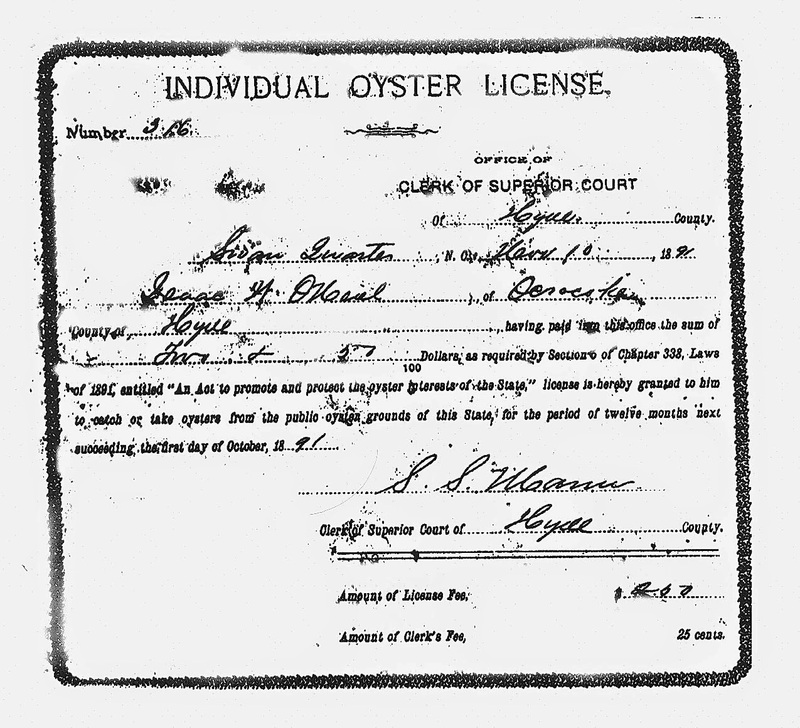 This photo is of Earl O'Neal's grandfather's 1891 Individual Oyster License (a transcription follows). Office of Clerk of Superior Court of Hyde County, Swan Quarter, N. Co, Nov. 10, 1891. Isaac W. O'Neal of Ocracoke, county of Hyde, , having paid into this office the sum of two and 25/100 Dollars as required by Section (?) of Chapter 338, Laws of 1891, entitled "An Act to promote and protect the oyster interests of the State," license is hereby granted to him to catch or take oysters from the public oyster grounds of this State, for the period of twelve months next succeeding the first day of October 1891. Earlier this month, the North Carolina Department of Public Instruction released its first "Public School Performance Grades." On a scale of A-F, Ocracoke School earned an A. As one of only 12 schools in North Carolina to earn an A, Ocracoke School thus joined the elite 5.4% of top-ranking schools in the state. You can read more about Ocracoke School and this recent recognition in the Ocracoke Current and in the Ocracoke Observer. Congratulations to the students, teachers, aids, and principal of Ocracoke School...and to the students' parents, their families, and the wider community! On Monday evening at Deepwater Theater, Keith Rittmaster, Natural Science Curator of the N.C. Maritime Museums, presented a fascinating program on North Carolina Whales to an enthusiastic crowd of about 50 people. Capt. Rob Temple published an informative story about the presentation (with more photos) on the Ocracoke Current. You can read the full article here: http://www.ocracokecurrent.com/106267. Keith's presentation focused primarily on natural science and ecology related to North Carolina whales. I will be publishing an article I wrote about the history of whale and dolphin fisheries on the Outer Banks in a future Ocracoke Newsletter. Look for that in the next month or so. In March of last year I published an Ocracoke Newsletter about the mailboat Aleta, "Boat Hauled Mail, More," that was a reprint of a 1948 article originally published in the Raleigh News & Observer. 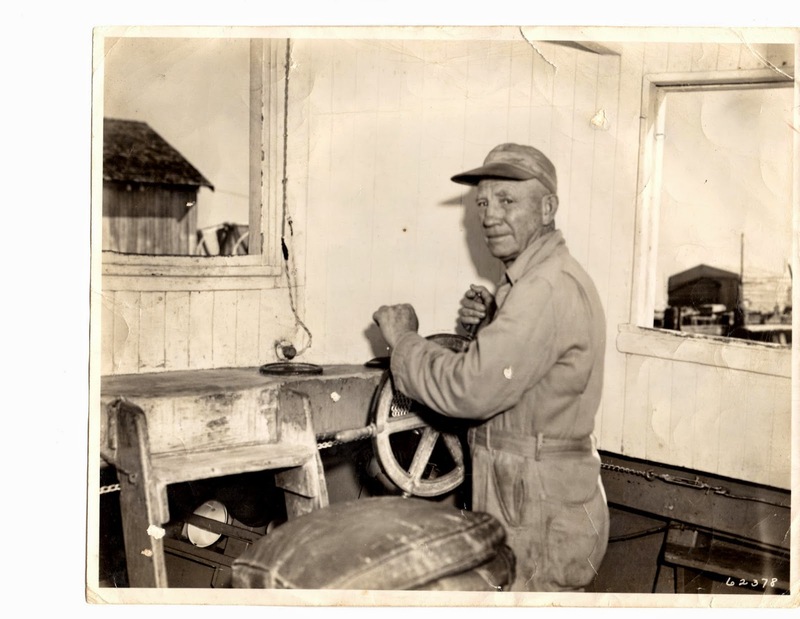 "As soon as the mail is aboard, Captain O'Neal 'gets her under way' and that is all you see of him until the boat docks at Ocracoke in Silver Lake, the natural boat basin on the island." 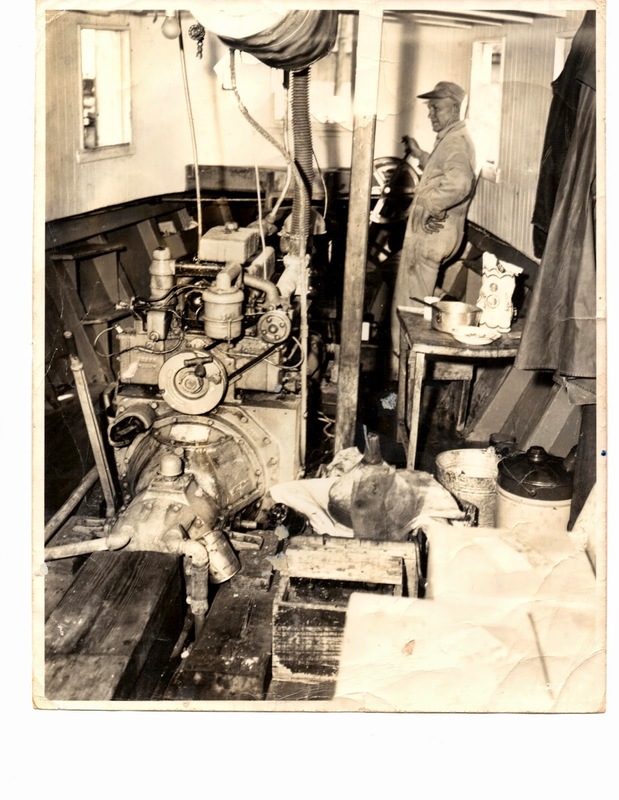 "The engine room is on the same deck with the passengers' cabin, but captain O'Neal closes the door to the engine room and all that is heard from the room is the incessant roar of the powerful diesel engine which pushes the boat." According to a paper dated October 27, 1948 from the Caterpillar Tractor Co. pasted to the back of the photo, "A 'Caterpillar' Diesel D4400 Marine Engine powers the 'Aleta', mailboat running to Ocracoke." To get a sense of Capt. George's job, enlarge the photos, take a careful look...and imagine spending 8 hours a day (4 hours each way from Ocracoke to Atlantic, NC and back), as Capt. George did, in that Spartan cabin, peering out those small windows, with the constant roar of the Diesel engine just a few feet away! Two years ago I wrote a short post about the village of Rodanthe on Hatteras Island. I mentioned that Rodanthe was re-named by a post office official when the first post office was established there in 1874 (presumably, and ironically, because it would be easier to spell and pronounce than the historic name, North Chicamacomico). The village (pronounced Roe-DAN-thee) is also a traditional Greek girl's name (pronounced Roe-DAANTH, meaning "rose bud"). I recently discovered that Rodanthe (apparently, both the girl's name and the village) were named after a yellow flower with pink and white florets, Rhodanthe manglesii. This flower is native to western Australia. According to Jan DeBlieu in her book, Hatteras Journal, "It has never bloomed on the Outer Banks.". Just a bit of Outer Banks trivia today. North Carolina is a long state (more than 500 miles from east to west), and geologically diverse (Outer Banks & Tidewater, Inner Coastal Plain, Piedmont, and Appalachian Mountains). One of the differences between the eastern and western areas of the state is illustrated by a comment in David Cecelski's 2000 book, A Historian's Coast, Adventures into the Tidewater Past. In discussing storms, hurricanes and nor'easters, Cecelski writes, "Mountains are pushed upward with staggering patience by slow tectonic grinding, an inch or two a year, until they reach the sky. But that has never been our coast's way of doing things. Disaster and upheaval are its lifeblood, just as much as sand and salt water." 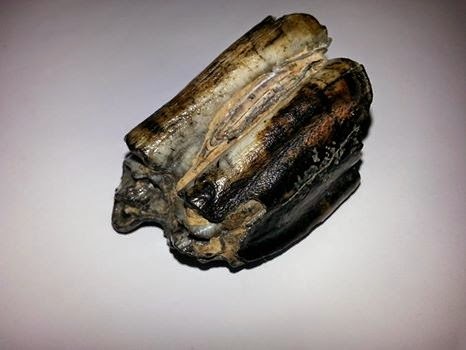 Soon after I published yesterday's post about the fossilized tooth, my neighbor Celia (who is now working on an archaeological site in Texas) said she thought it was a bison tooth. Late last night she sent me this photo and a brief comment. "I shared the tooth picture on Facebook and a paleontologist friend and an archaeologist responded--they both think it's bison." I agree. 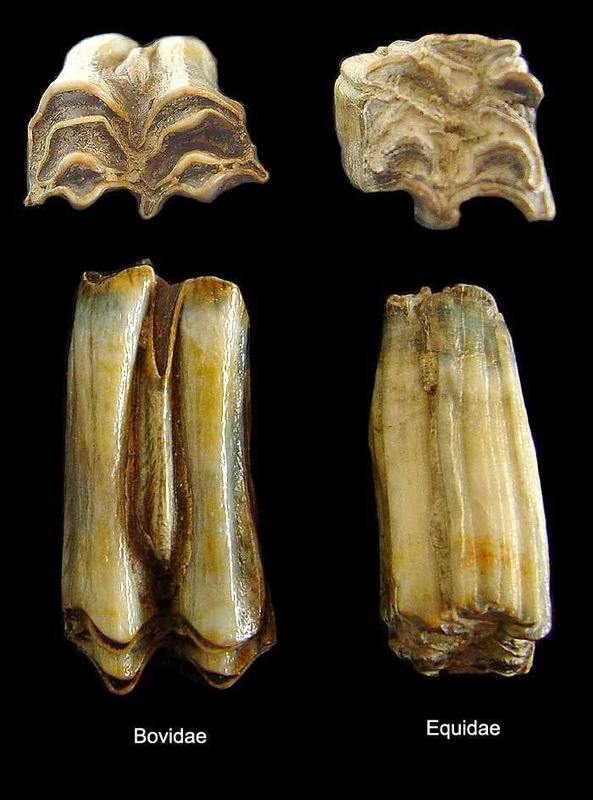 And I think that is even more interesting -- a fossilized bison tooth uncovered on Ocracoke Island! I wonder how old it is. The end of the last Ice Age was approximately 12,000 years ago. The retreat of the glaciers permitted humans to expand their populations into Europe, Asia, and eventually into the Americas. The climate change also probably led (either directly or indirectly) to the extinction of the horse in the North and South American continents. In the 1500s and 1600s Europeans reintroduced the horse, and American Indians, particularly Plains tribes, became excellent horsemen. Last month a visitor found these two fossilized horse teeth along the shore at Springer's Point. Discovering a 12,000 year old (or older) specimen from the last Ice Age is always a memorable event. Keep your eyes open as you stroll our beaches and sandy lanes. You never know what you might find! Whales are not a common sight in coastal North Carolina. However, every winter I hear about one or more sightings from shore. I occasionally see whales myself. 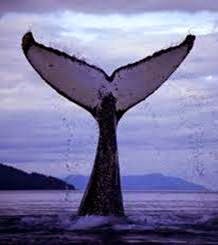 Just several weeks ago two or three whales were cruising some distance off-shore. They weren't very visible, but we could see their distinctive spouting. To learn more about these largest of all animals, come out to Deepwater Theater on February 9 at 7 pm. Ocracoke Alive is sponsoring a fascinating free program, "Coastal Whales in North Carolina," presented by Keith Rittmaster, Natural Science Curator, NC Maritime Museum, Beaufort, NC. For more info contact: David Mickey (252) 588-0042. And...look for a future Ocracoke Newsletter about Whale and "Porpoise" Fishing in North Carolina. "It's blowing so hard it could drive a goat into a quart jar!" There's always something to brighten up a winter day on Ocracoke Island. According to an article in the Elizabeth City, NC, Daily Advance, August 24, 2014, about the historic Roanoke River screw-pile lighthouse, "By the end of the 19th century, the United States, with its long coastlines had more lighthouses than any other nation." Ocracoke Island, of course, boasts one of those historic lighthouses. But Ocracoke is not a screw-pile lighthouse. Screw-pile lighthouses were designed to be placed in sounds, bays and rivers. Typically they were one-and-a-half story buildings mounted on threaded wooden (later, steel) pilings that were screwed into the sandy or muddy bottom. According to Wikipedia, "Perhaps as many as 100 spider-like, cottage-type (1½-storey wooden dwelling) screwpile lighthouses were built...." NCpedia claims that "At least six screw-pile lighthouses hovered over North Carolina's sound waters in the second half of the nineteenth century." One of those screw-pile lighthouses was located in Pamlico Sound. Built in 1904, the Bluff Shoal Lighthouse was located about 7 1/2 miles from Ocracoke. It is no longer extant. 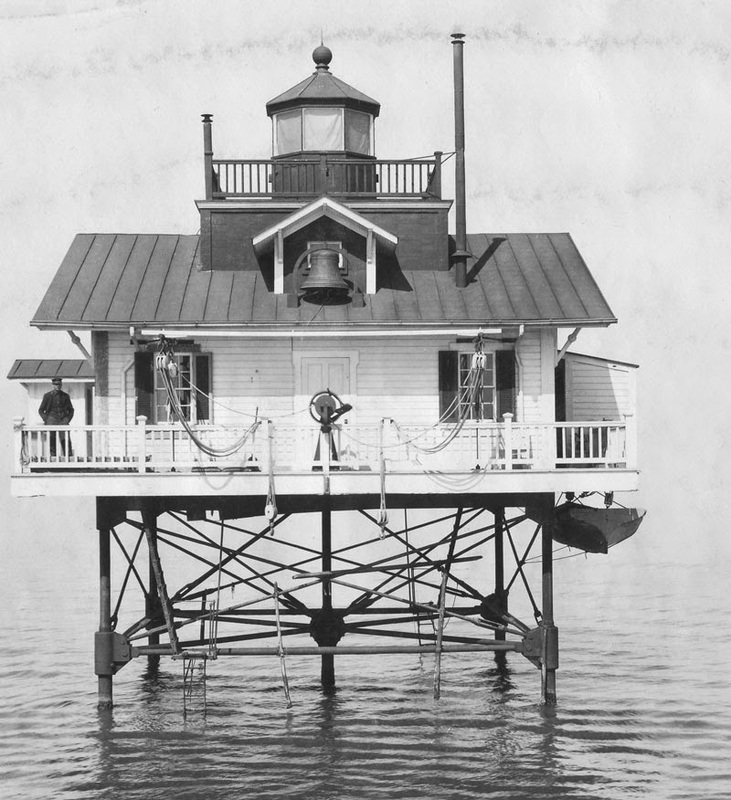 I believe the Roanoke River lighthouse (mentioned above) may be the only North Carolina screw-pile lighthouse still existing and restored to its original appearance, although it has been moved to Edenton.